Florida Gators freshman quarterback Treon Harris received a second-degree misdemeanor charge on Tuesday for driving without a license. The University Police Department stopped Harris in a motor vehicle on Saturday, Dec. 13 and cited him for neither possessing a license nor having one issued to him by the state. According to The Gainesville Sun‘s Robbie Andreu, who is citing the UPD’s report, Harris was speeding on campus (10 mph over the limit) at 11:29 p.m., when an officer pulled his car over after smelling (unburnt) marijuana. In the vehicle along with Harris were two fellow freshmen football players in defensive backs Jalen Tabor and J.C. Jackson. Officers smelled marijuana and found two small bags of the drug in a storage pocket of the vehicle, [UFPD public information officer Maj. Brad] Barber said. No charges were filed because none of the players was in possession of marijuana and the car did not belong to them. “They did not determine nor did anyone admit to the possession of the marijuana itself,” Barber said. Harris’s arraignment is set for Jan. 15 at 1:30 p.m. Indeed, Florida law gives the clerk of the court ability to throw out this charge for a $5 fee as long as a citizen possesses a license prior to his arraignment. 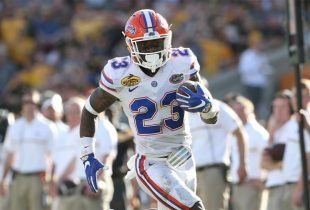 Harris is expected to start for the Gators against the East Carolina Pirates in the 2015 Birmingham Bowl on Saturday, Jan. 3 at Legion Field in Birmingham, Alabama. Tabor was a bright spot for the Gators on the field this season. He was previously arrested on a marijuana possession charge on May 27, marking the first arrest of a Florida football player in more than a year. Interim head coach D.J. Durkin is expected to release a statement Friday afternoon regarding whether the team plans to discipline the players. Why was he pulled over? And why did the officer search the car? Mike did you not read the article. It covers both points, he was pulled over for going 10 over, and searched due to the smell of weed. The story was updated. He might have commented before that information was added. Reading comprehension not your strong suit Mike? He was pulled over for going 10MPH over on campus. The car was searched because it smelled like weed! Great, do we have our own Jameis over here? Meanwhile, Will Grier practices football. I’m not sure that Harris has the maturity to be the starter at Florida. Speeding with weed screams bad judgement. This makes me very nervous about his leadership. I hope this is a jolt to him. I doubt it. How in the heck does he not have a drivers license? And why is he driving since he doesn’t have a license? Looks like Tabor really lucked out since he was already on “deferred prosecution”. Seemingly a common status for football players these days. Huntley Johnson has found a lucrative career. I wonder who pays him? Whose car is it? Was it “loaned” by a Booster, or owned by a student? I am sure that the people writing the stories know, or can easily learn, that fact. Someone, somewhere, will no doubt ask. Wow, WM barely gone a week and we are back on the police blotter again. All 3 of these guys should be benched for the bowl game at the very least, as much as I would hate to lose Harris and Tabor. At some point the football culture needs to learn that Marijuana is illegal and if the only ticket in this case was driving on a suspended license, and no DUI or possession, then they should consider themselves extremely lucky and almost learned a very harsh lesson. And before you liberal whiners complain about the waste of time, marijuana is illegal it is as simple as that. Whether you believe it should be or not, it is. As long as it is it is more than foolish to put themselves in that kind of a position. “Wow, WM barely gone a week and we are back on the police blotter again.” Right nobody got in trouble with the law under Muschamp’s watch. Your entire post rendered completely irrelevant. gatorboi352, you are correct sir. Riiiiiight. Because no student under 21 at the University of Florida has EVER consumed alcohol. The average student isn’t putting a potential multi-million dollar paycheck on the line either. Someone like Tabor who is very likely to be playing on sundays (assuming he limits his stupidity) should keep that in mind. And yes, they are young kids, but they also have unbelievable advantages the rest of us don’t have in counselors, training, constant coaching in how to avoid these situations and how to handle it, etc. that they continue to choose to ignore at their own peril. Underage drinking while not condoning it is a very different crime than possession of an illegal narcotic. These guys got incredibly lucky to be charged with as little as was charged in this case and apparently no bowl ramifications either. While I really want to respect your opinions, this show how wildly out of touch you are. The pro-pot platform isn’t as laid back as you’d think they are, Ken. Nor, ironically, are they in touch with the reality that no matter how you dress it up, possession of marijuana is illegal. They want to turn it into a moral issue, a philosophical issue, even a medical issue . . and if you don’t play by their rules, and have the audacity to state the very simple and clear truth that marijuana is in fact an illegal narcotic, then it’s you, and not them, who are “wildly” out of touch. They always come out of the woodwork with the pro-marijuana dogma when a player gets in trouble for it and one of us dares to criticize it. . as if everything other than marijuana being illegal was the issue. . when, in fact, the ONLY issue is that it’s illegal. . and, yes, it’s a narcotic. So pointing out the logical fallacies in how you treat pot compared to underaged drinking means we’re part of the pro-pot platform now, eh? How dare we have the audacity to state that this isn’t nearly as big of a deal as some are making it out to be? You two are a trip sometimes. Anyone disagrees or offers a different viewpoint, and, well…..they must be some hippie liberal stoner, obviously. Nevermind that 58% of the state voted for medical use in the last election. I’ve never touched the stuff and don’t really have plans to. Doesn’t mean I don’t see the stupidity and double-standards in how it’s enforced compared to commonly accepted abused drugs, like alcohol and prescription pain-killers. (A) Opium, opiates, derivatives of opium and opiates, including their isomers, esters, ethers, salts, and salts of isomers, esters, and ethers, whenever the existence of such isomers, esters, ethers, and salts is possible within the specific chemical designation. Such term does not include the isoquinoline alkaloids of opium. (B) Poppy straw and concentrate of poppy straw. (C) Coca leaves, except coca leaves and extracts of coca leaves from which cocaine, ecgonine, and derivatives of ecgonine or their salts have been removed. (D) Cocaine, its salts, optical and geometric isomers, and salts of isomers. (E) Ecgonine, its derivatives, their salts, isomers, and salts of isomers. What exactly are you going to suspend these players for? There is this thing called a Student Code of Conduct. Administration has to follow those rules when it comes to handling student discipline. They can’t dole out discipline based on personal opinions or assumptions. Students have rights and they can appeal suspensions. 1) Traffic citation issued at scene; no arrest case will most likely be dropped 2) marijuana smelled (unburnt according to article).. I don’t believe that two SMALL sealed baggies of Marijuana in a glove box is not going to omit that much odor. I’m thinking UFPD puled a fast one to get access to the car. So again my question is suspend for what??? Being stupid? I’m pretty sure the student COC doesn’t have a section on being stupid and young. I say most likely they will get extra conditioning or internal discipline and it’s over. Jalen Tabor is on the verge of some serious issues if he doesn’t clean it up! My question is who did the car belong to? Who is going to loan those boys a car…another football player? You realize that seldom do athletes go through all of the due process you just described? Last athlete I recall that had all that happen was Cam Newton. “Violation of team rules” which to us outside of the team is ambiguous is often cited for suspensions and other disciplinary action and we seldom know why or cause. They have their own code of contact that is at a different standard (while includes) the standard code but also because they are representing the university in many ways is much stricter. I am sure you all know this so these arguments on “Pot isn’t bad” or “DEA terrorism”, etc. etc. are absurd and while you may wish it so, it isn’t. When you are getting all of your school paid for and you represent the university you agree to follow specific rules to retain those privileges. If you don’t, then many levels of punishment are available depending on the example the coach wishes to set or how bad the players action was or some combination. Did the Gainesville media bother to investigate who the car belonged to? I truly don’t know why marijuana is still illegal since it is much less harmful than alcohol. However it is always bad judgement to smoke pot or drink and get behind the wheel of what could become a killing machine. tHIS IS JUST STUPID. hARRIS NEEDS TO GROW UP! I agree with Ken. At some point some of these athletes need to come to terms with the fact that marijuana, in Florida, is illegal. If it’s so important to you that you must smoke at all costs, then go play football in a state where it is legal. And they were very lucky that the cop wasn’t aggressive. The smell of marijuana is circumstantial evidence that it was being smoked and, therefore, was in the possession of somebody in that car. Sounds like Tabor learned nothing from his prior brush with the law. It’s a bad look, man. Well at least Driskel has had no off the field issues!! What is silly is that this is even a story. It’s much ado about nothing. Harris needs to get a license, after he does that, it’s over. For all of you high and mighty folks, you need to learn something. Young people make mistakes, and some make more than one mistake. It’s part of growing up. The prefrontal cortex, which controls decision making, is not fully developed until around the age of 25. That’s a major factor in why young people do stupid things. Go on “Youtube,” some kids are so dumb that actually post videos of themselves being stupid. Think back to when you were in college, how often were you stupid? The point is that kids make mistakes, and they make make more than one, but you shouldn’t crucify them when they do. How does that help them or anyone else. For those of you that are judgmental and say they should be suspended, I ask this. Why? To make yourself feel better? Are you more worried about UF’s image than the welfare of the kids? I’m sure some of you profess yourselves to Christians, but you seem to have not learned what Jesus was talking about when he invited someone to cast the first stone. How do you sleep at night? We have a different code of conduct at UF than you do at FSU. . that is to say, we actually have one. And you can get off of your high-and-mighty, holier-than-thou soap box. Nobody that I read was encouraging anything other than an appropriate response to the situation. Nobody was advocating life in prison. We do things a little differently in Gainesville than you do in Tally, troll boy, and we like it like that. This is nothing. Besides the fact that Gville police are over aggressive with athletes, it is not uncommon for them to falsely claim to smell weed just to justify a search. I’ve witnessed it first hand. Oops, didn’t see the part about the baggies. I heard marijuana was very close to being legalized on the last vote. Maybe after the next round, that ballot will pass and marijuana will be a none issue as it should be. This will greatly reduce the police blotter as pot busts seem to be the most common at UF. You realize that it is illegal at the federal level? No state law supercedes that. The fact that this particular administration has chosen to not enforce laws that it is constitutionally sworn to do notwithstanding. As long as it is illegal federally, the feds can come in at any time and enforce it. Thank God we don’t have an attorney general that’s worried about prosecuting people for violating the federal law against pot. I know it drives the terrorists at the DEA crazy, but they should suffer. Yes I call the DEA terrorists because they enjoy making people suffer. I don’t know another adjective to describe someone who gets pleasure from harming other people, sometimes doing so while pretending to be their friend. Your first comment was ignorant enough. . then you had a chance to correct it in the 2nd comment, but you still chose not to. Did you notice, Mr. “It’s Always The Cops’ Fault” that he actually gave these kids a break? And since the car didn’t belong to any of the athletes in it, how did he know he was pulling over athletes? Were they in full uniform? But don’t let a little thing like the facts get in the way of your left wing propaganda. Why start now, right? By all means, please continue to fan the flames of hatred borne of ignorance and lies.